Here’s that delightful Sixth Doctor Gilbert & Sullivan musical of Pirates of the Caribbean that you always wanted. Mind you, if Dr. Smythe and the Doctor had barged in on me when I was having a rocky night, I would have been in no mood to listen to their lengthy storytelling. Then again, I suppose it’s difficult for a lowly student to be rude to a favourite professor, let alone dislodge the Sixth Doctor from one’s sitting room. Sally in this audio is a cynical, college-aged Bëorn, with Evelyn as her Gandalf and the Doctor as a very oversized Bilbo, telling her a tale of adventure on the high seas. The story within the story is an ostensibly lighthearted yarn of swashbuckling, piracy, treasure maps, mutiny, and all the usual Talk Like a Pirate Day clichés. There’s some clever meta in the delivery: the more Evelyn and the Doctor draw attention to their unreliable narration, the more it sounds like they’re telling a true story badly to disguise the grim parts. The sillier it gets, the more serious it becomes. The Doctor’s having a merry time with it, giving himself airs and filking to Pirates of Penzance and HMS Pinafore, but Evelyn’s getting all choked up. What’s her secret? And just why did they drop in on one of her students to regale her with an all-night oral Doctor Who marathon? Caricatures abound: Red Jasper the mad pirate captain who lays it on thicker than Barbossa, a matched pair of redoubtable first mates, an earnest cabin boy named Jem straight out of Treasure Island, and a foppish Captain Swan (no relation to Elizabeth) royally deserving of a pie in the face. Among the guest characters, Sally is the only one who sounds like a real person, skeptical, cynical and unconvinced. The Doctor and Evelyn keep slipping in and out of fiction, vacillating between comic and deeply compassionate figures. Colin Baker and Maggie Stables are a brilliant TARDIS team, as usual. Much like the exterior and interior of the TARDIS, the sober framing story of the Doctor and Evelyn crashing Sally’s flat doesn’t match the tone of the pirate farce that they’re telling her. The disjunction in this audio between comedy and tragedy, fantasy and realism is somewhat jarring, but that’s the point. This is another of Big Finish’s experiments in storytelling, and the genre juggling is deliberate. The result is a well-loved Sixth Doctor story with entertaining songs some fans have memorised (see below). 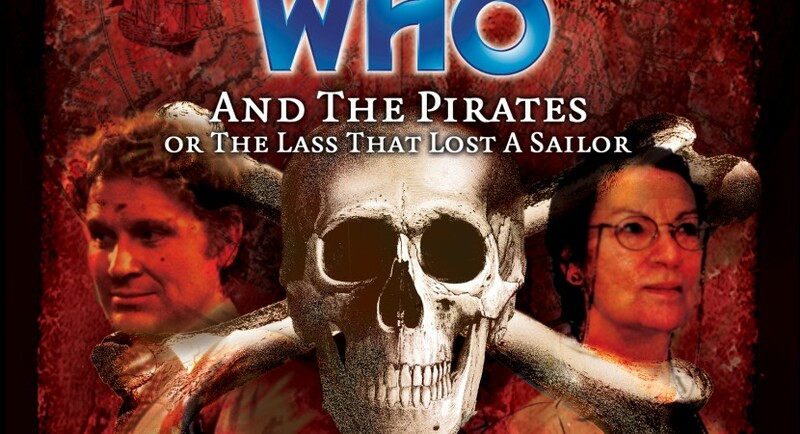 The audio’s subtitle, The Lass Who Loss a Sailor, turns out to be the sober flipside of the lighthearted Doctor Who and the Pirates musical. While I enjoyed songs like “Gallifreyan Buccaneer” and “Evil Evelyn the Pirate Queen,” I had a little trouble with this audio because of the mood whiplash. A suicide watch isn’t the ideal frame for a lighthearted Doctor Who musical. On the other hand, a story dealing solely with suicide would’ve been too depressing to listen to without some sort of leavening, and the musical all by itself would have felt fake and trite without the real-world grounding. It’s certainly true that friends respond to suicide attempts by fluttering around making nuisances of themselves and driving that person batty in their well-intentioned attempts to protect her from herself. But you don’t want my opinion about this audio. You want lyrics! I’ve seen lyrics posted elsewhere, but there’s a few lines I heard a little differently. So here’s my attempt to transcribe that famous song. And so to Time Lords all I say: remember me to Gallifrey! A sentiment we all agree: remember him to Gallifrey! A sentiment we all agree: remember him to Galli-Gallifrey! *Dekate = tenth part of something, especially booty taken from an enemy. I’d bet Jac Rayner has studied Greek and Latin at some point; many of her scripts betray a bookish liberal arts upbringing.